This morning in Huntington at 8:05AM it’s currently 39 degrees under overcast skies. Winds are calm. Relative humidity is 75%, dewpoint 32, barometric pressure 30.03” and falling. Snowpack is down to 4” at the stake. Yesterday’s high was 32, and the overnight low was 32. Low pressure just north of James Bay this morning as pulled a warm front up and through our region this morning. We’ll see cloudy skies with highs in the mid 40s with south winds 10 to 15 mph gusting up to 25 mph. The same low will sweep a cold front in our direction overnight bringing cloudy skies with a 50% chance of rain showers out ahead of the front. Lows will be in the upper 30s with southwest winds 10 to 15 mph. Monday should start out cloudy with a chance of rain or snow showers in the morning, then partly sunny with a slight chance of snow showers in the afternoon. Highs will start out the day in the upper 30s and fall into the upper 20s in the afternoon as the cold front moves through the region. Winds will be out of the northwest at 10 to 15 mph. Chance of precipitation is 40%. Monday should be partly cloudy and chilly with lows around 10 above and northwest winds 10 to 15 mph. Tuesday’s looking sunny and cool with highs only in the lower 20s and north winds around 10 mph. Tuesday night should be partly cloudy with a 40% chance of snow. Lows will be in the lower 20s. Last year on this date we had a high of 29 and a low of 2. We had 4″ of snow on the ground. Burlington norms for this date are highs of 39 and lows of 26. The record high was 63°F in 2006 (we had a high of 64). Tomorrow will be 1m31s shorter. The Moon is waxing gibbous, 8 days old with 63% illumination. 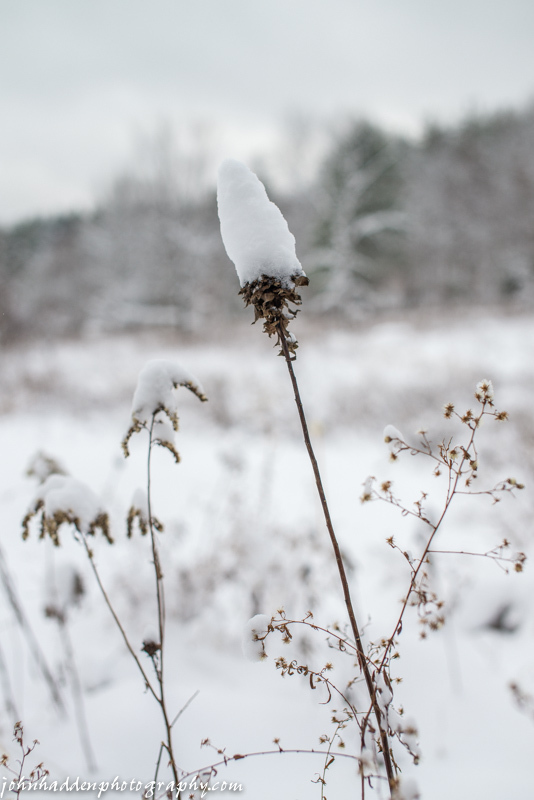 When the temperature drops—as it did the yesterday morning down to 6 degrees—the moisture rising from the open waters of Fargo Brook allows for tiny, delicate ice crystals to form on the dried weeds and flower stems along the stream bank. 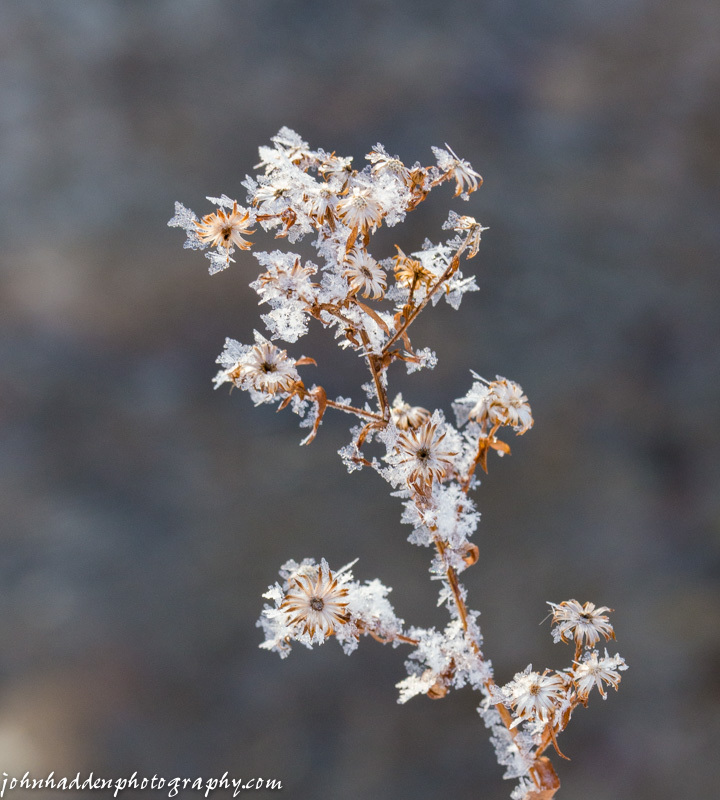 These dried asters were bedecked with crystals that caught the morning sunlight. Nikon D600, Sigma 105mm lens, ISO 800, f/13, 1/50″ exposure. This morning in Huntington at 7:30AM it’s currently 10 degrees under partly cloudy skies. Winds are calm. Relative humidity is 92%, dewpoint 8, barometric pressure 30/29” and rising. We picked up a 1” dusting of fluffy snow in the past 24hrs and have 6” at the stake. Yesterday’s high was 28, and the overnight low got down to 6. A cloudy but dry and seasonally cold day is on tap for the region today. Surface high pressure over the northeast this morning will slowly drift offshore through the day. A warm front lifting northward through the Middle-Atlantic States today will bring a period of light scattered mixed precipitation to the northeast tonight with a light coating of snow and ice possible. Warmer, above normal temperatures are expected for Sunday as the warm front lifts north of the border along with some patchy drizzle. We’ll see mostly cloudy with scattered flurries this morning. Highs will be in the mid 20s with light and variable winds, becoming southerly around 10 mph this afternoon. Tonight should be cloudy with a chance of snow showers and a slight chance of freezing drizzle until midnight, then a chance of sleet or rain showers or freezing rain after midnight. Lows will be in the mid 20s with temperature rising into the lower 30s after midnight with south winds 15 to 20 mph. Chance of precipitation is 50%. Sunday should be cloudy with a chance of drizzle and rain showers in the morning, then a slight chance of drizzle in the afternoon. Highs will be in the mid 40s with south winds 10 to 15 mph gusting up to 25 mph. Chance of rain is 40%. Sunday night should be cloudy with a chance of showers. Lows will be in the mid 30s with southwest winds 10 to 15 mph. Chance of rain is 50%. Monday’s looking Mostly cloudy with a chance of rain showers. Highs will be in the upper 30s with temperatures falling into the mid 20s in the afternoon as a sharp cold front moves in on northwest winds around 10 mph. Chance of rain is 40%. Monday night should be partly cloudy and chilly with lows around 10 above. Last year on this date we had a high of 23 and a low of 4. We had 4.5″ of snow on the ground. Burlington norms for this date are highs of 40 and lows of 26. Tomorrow will be 1m34s shorter. The Moon is in its first quarter, 7 days old with 51% illumination. Nikon D600, Sigma 50mm lens, ISO 200, f/3.5, 1/1600″ exposure. This morning in Huntington at 7:05AM it’s currently 22 degrees and snowing moderately under overcasts skies. Winds are calm. Relative humidity is 95%, dewpoint 21, barometric pressure 30.08” and rising. We picked up 1.5” of new snow overnight and have 8.5” at the stake. Yesterday’s high was 28, and the overnight low was 20. Light snow will end this morning as a weak area of low pressure moves east of the area. Some clearing will then develop as high pressure moves east from the Great Lakes later in the day. We’ll see mostly cloudy skies with light snow likely this morning, then a chance of snow showers a possible glimpses of sunshine this afternoon. We should see snow accumulations of a dusting to 2 inches. Highs will be in the upper 20s with northwest winds around 10 mph. Chance of snow is 70%. Tonight should be partly cloudy with lows around 12 and west winds around 10 mph until midnight, becoming light and variable. Saturday should start out partly sunny in the morning, then become mostly cloudy with a slight chance of snow showers in the afternoon as a warm front lifts northward. Highs will be in the upper 20s with south winds around 10 mph. Chance of snow is 20%. Saturday night should be cloudy with a chance of snow or sleet. Lows will be in the mid 20s with south winds 10 to 15 mph. Chance of precipitation is 40%. Sunday’s looking mostly cloudy and milder with highs in the lower 40s and south winds 10 to 15 mph. Sunday night should be mostly cloudy with a 40% chance of showers. Lows will be in the mid 30s. Last year on this date we had a high of 27 and a low of 8. We picked up 4.5″ of new snow and had 5″ at the stake. Burlington norms for this date are highs of 40 and lows of 27. Tomorrow will be 1m37s shorter. The moon is waxing gibbous, 5d 23h old with 40% illumination. Nikon D600, Sigma 50mm lens, ISO 200, f/3.5, 1/1250″ exposure. This morning in Huntington at 7:45AM it’s currently 25 degrees under overcast skies. Winds are calm. Relative humidity is 92%, dewpoint 23, barometric pressure 29.98” and rising. We picked up a storm total of 13.25” (3.5” @ 5:00PM, 7” @ 10:00PM, and 2.75” this morning). We have 10.5” at the snow stake. Yesterday’s high was 39, and the overnight low was 25. The nor’easter that brought us this white Thanksgiving is now headed up into the Canadian Maritimes. We’ll see clouds and some sun this morning with more clouds for this afternoon with a few flurries or snow showers possible as a minor upper level disturbance slides to our north. Highs will be around 30F with light and variable winds. Tonight should bee cloudy with a few snow showers after midnight. Low will be 23F with light and variable winds. Chance of snow is 30%. Friday should be partly cloudy with high around 28F and northwest wind at 5 to 10 mph. Friday night should be mostly clear with lows around 16F and light and variable winds. Saturday’s looking partly cloudy with highs around 32F and south-southeast winds at 5 to 10 mph. Saturday night should be mainly cloudy with snow showers before midnight. Low 26F with temps rising to near freezing. Winds SSE at 5 to 10 mph. Chance of snow 40%. Last year on this date we had a high of 42 and a low of 27. 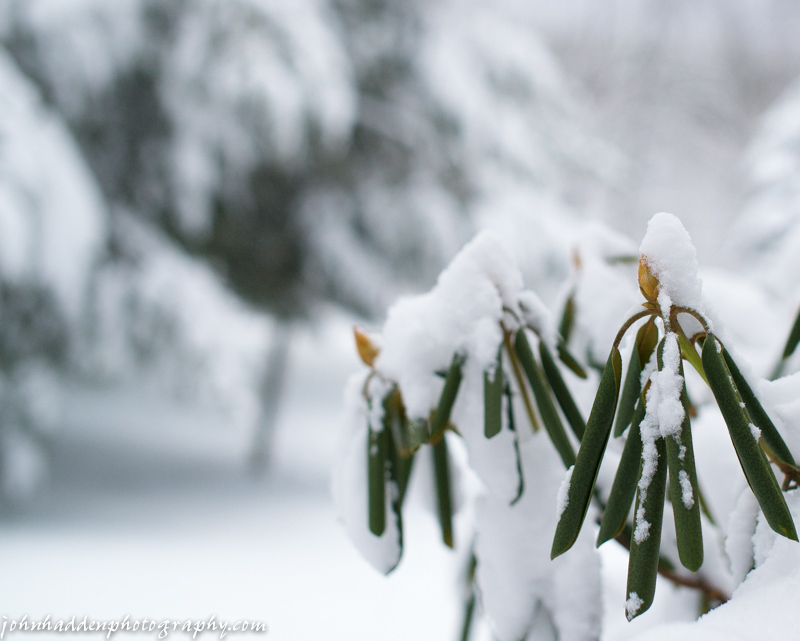 We picked up 0.62″ of rain and had 1″ of snow on the ground. Burlington norms for this date are highs of 41 and lows of 27. The record high was 66°F in 1896. The record low was -1°F in 1957. Tomorrow will be 1m41s shorter. The Moon is a waxing crescent, 5 days old with 29% illumination. We wake up to a changed world! Welcome to winter folks! Nikon D600, Sigma 50mm lens, ISO 800, f/3.2, 1/400″ exposure. This morning in Huntington at 6:50AM it’s currently 33 degrees under overcast skies. Winds are calm. Relative humidity is 73%, dewpoint 25, barometric pressure 30.20”. Yesterday’s high was 57, and the overnight low was 33. There is a Winter Storm Warning in effect for our region from 9:00AM today until 7:00AM Thursday morning. Thanksgiving day should be cloudy with highs near 30F and light and variable winds. We may see a few lingering snow showers, but nothing significant as the storm is a fast mover and will be well up into the Canadian Maritimes by Thursday morning. Thursday night should be partly cloudy with lows around 21F and light and variable winds. Friday should be partly cloudy with high around 30F and light and variable winds. Friday night should be partly cloudy with lows around 17F and south-southwest winds at 5 to 10 mph. Last year on this date we had a high of 34 and a low of 29. We had 1.75″ of snow on the ground. Burlington norms for this date are highs of 41 and lows of 28. The record high was 64°F in 1979. The record low was -3°F in 1938. Tomorrow will be 1m45s shorter. The Moon is a waxing crescent, 3d 23h old with 19% illumination. 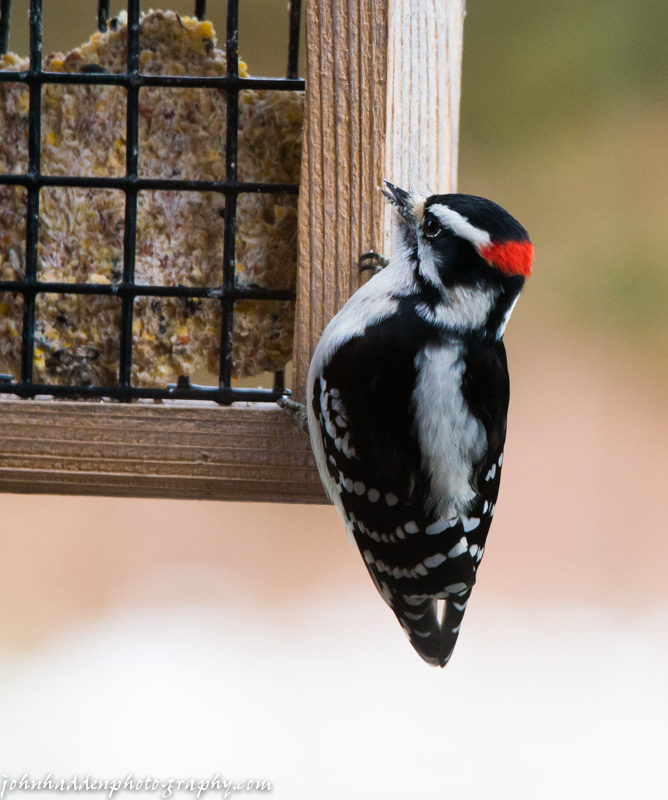 Downy woodpeckers (along with their larger cousins, the hairy woodpecker) are regular visitors to our feeders. This male made an appearance the other day. Nikon D600, Sigma 120-400mm lens @ 400mm, ISO 2000, f/9, 1/640″ exposure. This morning in Huntington at 7:15AM it’s currently 45 degrees under mostly clear skies. Winds are out of the west at 2-6 mph. Relative humidity is 66%, dewpoint 34, barometric pressure 29.75” and rising rapidly. We picked up 0.56” of rain yesterday. Yesterday’s high as 67, and the overnight low was 45. We had some pretty good wind blowing here yesterday with our top gust of 31 mph. Not all that fast compared to some of our more exposed neighbors (one of whom lost part of their roof in the morning! ), but strong enough for our protected hollow. The squall line that came through at around 9:45PM last night was particularly powerful! A brief period of high pressure is bringing us this morning’s clear skies. We’ll see partly sunny skies today with highs in the upper 40s and southwest winds around 10 mph gusting up to 25 mph this morning. Tonight should be partly cloudy with lows in the upper 20s and west winds around 10 mph until midnight, becoming light and variable. A coastal storm will move up the Atlantic seaboard Wednesday bringing a pretty good shot of snow just in time for holiday travel—especially in southern parts of the forecast area. We’ll see cloudy skies with a slight chance of snow in the morning, then a chance of snow or rain in the afternoon. Highs will be in the upper 30s with light and variable winds. Chance of precipitation is 50%. Wednesday night should be cloudy with a 50% chance of snow. Lows will be around 20 with light and variable winds. Thursday’s looking cloudy with a 40% chance of snow. Highs will be in the lower 30s with light and variable winds. Thursday night should be mostly cloudy with a 30% chance of snow showers. Lows will be in the lower 20s. At this point I’m seeing snowfall predictions of anywhere from 8-10″ in southern parts of Vermont and NH, down to 1-3″ for the Champlain Valley. I guess we’ll have to wait and see. Safe bet though that driving will not be all that good Wednesday night into Thursday morning, so if you’re traveling for Thanksgiving, take that into account. Last year on this date we had a high of 30 and a low of -1 (!). We had 2″ of snow on the ground. Burlington norms for this date are highs of 42 and lows of 28. The record high was 67°F 2001 (Burlington tied its record of 67 yesterday). The record low was -1°F in 1938. Tomorrow will be 1m48s shorter. 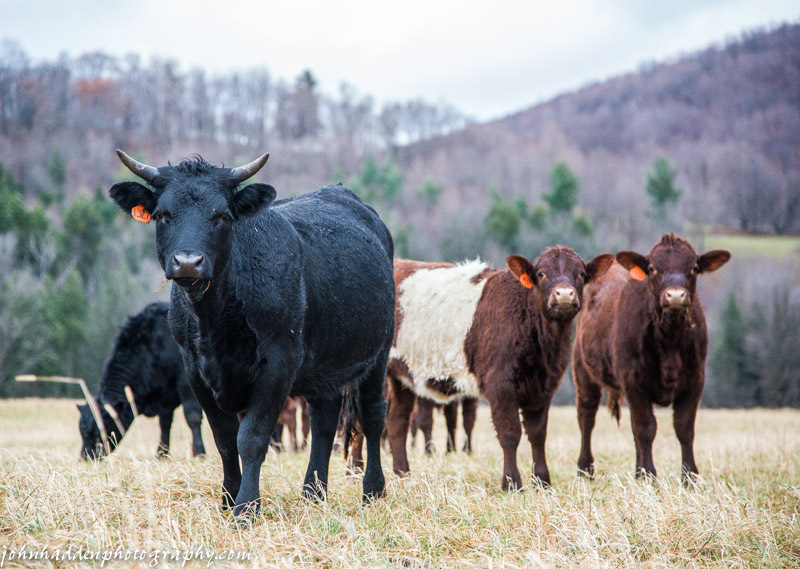 Maple Wind Farm recently moved their young beef cattle down to the pasture along School Street. They’re pretty shy, but a tad inquisitive too. Nikon D600, Nikon 24-120mm lens @ 120mm, ISO 2000, f/4, 1/2000″ exposure. This morning in Huntington at 6:50AM it’s currently a blustery and rainy 48 degrees under overcast skies. Winds are out of the southwest at 8-14 mph. Relative humidity is 90%, dewpoint 46, barometric pressure 29.62” and falling rapidly. We picked up 0.19” of rain overnight. Yesterday’s high was 51, and the overnight low was 38. Low pressure currently out over the western Great Lakes will swing a warm front through our region today. We’ll see rain, mainly this morning, with highs in the upper 50s to near 60 along with gusty south winds 15 to 20 mph. Chance of rain near is 100%. Tonight should be cloudy with a chance of rain until midnight, then partly cloudy with a slight chance of showers after midnight. It’ll be breezy with lows in the lower 40s and southwest winds 15 to 25 mph gusting up to 35 mph. Chance of rain is 50%. The aforementioned low will move northward towards James Bay by Tuesday dragging a cold front through our region and returning temperatures to more seasonable norms. We’ll see partly sunny skies in the morning, then mostly cloudy skies later in the day. Highs will be in the mid 40s with southwest winds 15 to 20 mph gusting up to 30 mph. Tuesday night should be cloudy with lows in the upper 20s and west winds 10 to 15 mph. A brief ridge of high pressure will move in early Wednesday before we begin to feel the effects of a coastal storm later in the day. We should see cloudy skies with a 40% chance of snow and highs in the mid 30s with light and variable winds. Wednesday night should be cloudy with a 50% chance of snow. Lows will be in the mid 20s. At this point it looks like this coastal storm will impact mostly the southern and eastern parts of our forecast area, with only a quarter to half-inch of snow expected in our area. Stay tuned! Last year on this date we had a high of 20 and a low of 10. 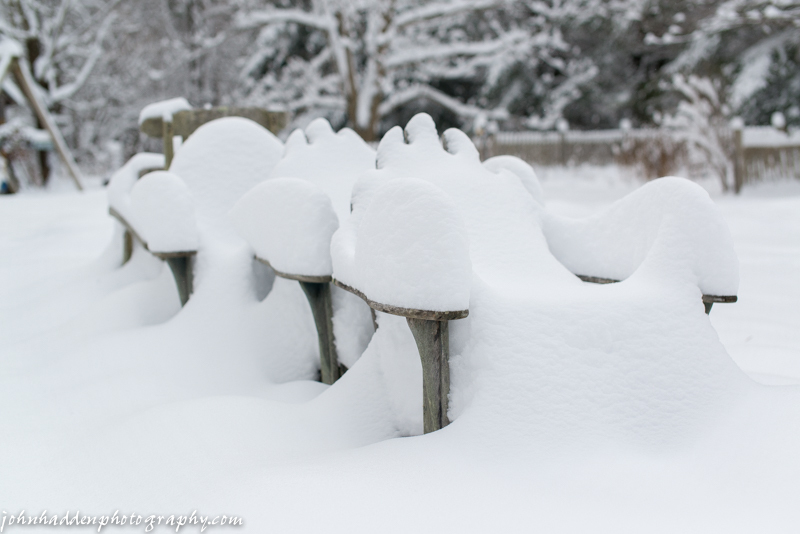 We picked up 3.75″ of snow. The record high was 65°F in 1931. The record low was 2°F in 1956. Tomorrow will be 1m51s shorter. The Moon is a waxing crescent, 1d 23h old with 5% illumination. 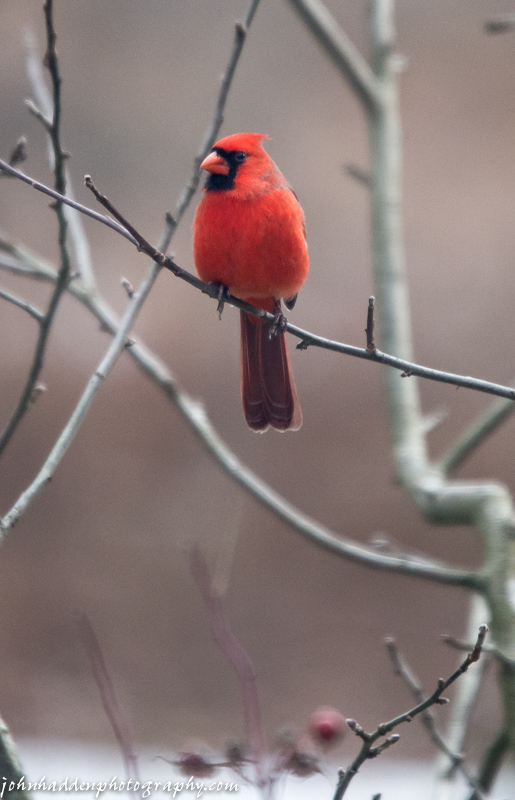 Nikon D600, Sigma 120-400mm lens @ 400mm, ISO 2000, f/5.6, 1/640″ exposure.